I got set for life at the age of three. My two loves – writing and animals – were born. My daddy tells me I can’t possibly remember. But I do. The pickup truck had wooden railings around the back, and it came around the side of our house. I was standing by our kitchen table, watching out the window. He says someone must have told me these details. But no one had to. Because of what stood in the back of that truck, inside those railings. It was our milk cow. I called her Mama Red. And she was leaving. I was three years old. And I loved her. But he kept his fingers moving, alternating steady streams into the pail in a rhythm I did not understand. “I’d hurt her if I didn’t,” he said. I didn’t believe him. I stopped drinking milk that day. That same year, I began refusing any article of clothing, unless it had a pocket in it. I am talking shirt, skirt, pants, dress. Why? Because I wanted to stuff them with a folded-up piece of paper and a pencil. My mama kept me still in at New Prospect Baptist Church with a pencil and S&H green stamp book. I did not draw in it – I just wanted to move my pencil across the pages. I had no idea back then that what I had witnessed and felt that day with that milk cow would shape me as a writer. I wrote my first play in the fourth grade about a girl who finds a hurt hummingbird on her way home from school. I titled it “Taking Care of Birds,” and my teacher let my class perform it for the entire Centerville Elementary School. In the fifth grade, I wrote my first novel about a girl named Dale (my middle name) Carson, who wanted a pony. Things moved along even further a year and a half later, when, after a particularly mundane corporate day, I wrote my obituary on a legal pad, and it said I was manager of Media Relations, and I shook my head and said No way. I skipped a space and wrote the one that would give me peace. It said: Brenda McClain, writer, died today in…She also worked as a communications consultant. I turned to my computer and wrote my resignation and walked out two weeks later and launched my consulting business (McClain Communications) and began giving my writing the best of me versus the crumbs I had been giving it. That was year 1990. I’ll cover a lot of ground fast here: I wrote two failed novels, got a literary agent, lost a literary agent. 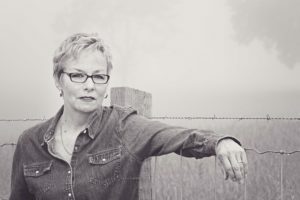 But, when I returned to what was set in motion in a three-year-old Anderson, South Carolina, farm girl – writing and animals – my literary career changed, and my novel, One Good Mama Bone, was born. I even went so far as to write about a mama cow. I named her Mama Red. And I love her. My heart first opened with that milk cow. I’ve heard it said, Write what you know. Others say, Write what you want to know. I say, Write what opens your heart. Because you remember. You do. • South Carolina Arts Commission awarded me the Fiction Fellowship in 2005. • I’m a two-time winner of the South Carolina Fiction Project (2003 and 2007). • I grew up on a seventy-two acre beef cattle and grain farm in Anderson, South Carolina. • I have a twin, and, to this day, we’re known as “the McClain twins.” Which is fine by me. • I’m at work on my next novel, Took, which features another farm animal, chickens. Happy to say it has won the 2016 William Faulkner-William Wisdom prize for Novel-in-Progress.